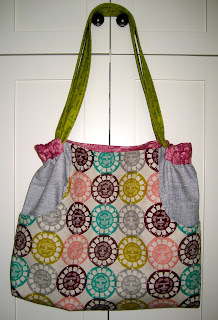 Lately I've been sewing more than posting, which is a good thing! I'm also waiting for my hubby to return with our new camera to show you some of the things. Tomorrow I will do my best not to say, "How was Israel, oh, and which bag is our camera in?" for at least the first five minutes after reuniting! It's been a while since I've done a pattern review. Mostly because I use the same 4 patterns over and over and over! Well, this week I tried something new that I've wanted to do for a while. 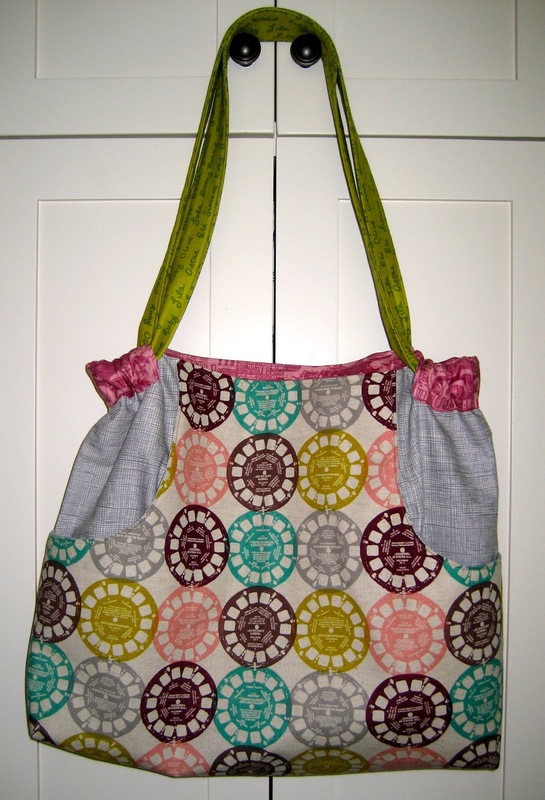 The Anna Maria Horner Multi-Tasker Tote! Prior to this, the only Anna Maria Horner pattern I had attempted was the Socialite Dress, which I loved. Oh, and from her baby book, the Quick Change Trousers, which I've sewn up a few times (another pair this week, actually). Naturally, she does an amazing job on patterns! This one was wonderful and surprising quick to sew up. All of the instructions were clear as a bell, with helpful illustrations throughout. I don't think I even had to re-read something 17 times as I normally do in at least one part of every new pattern I sew. 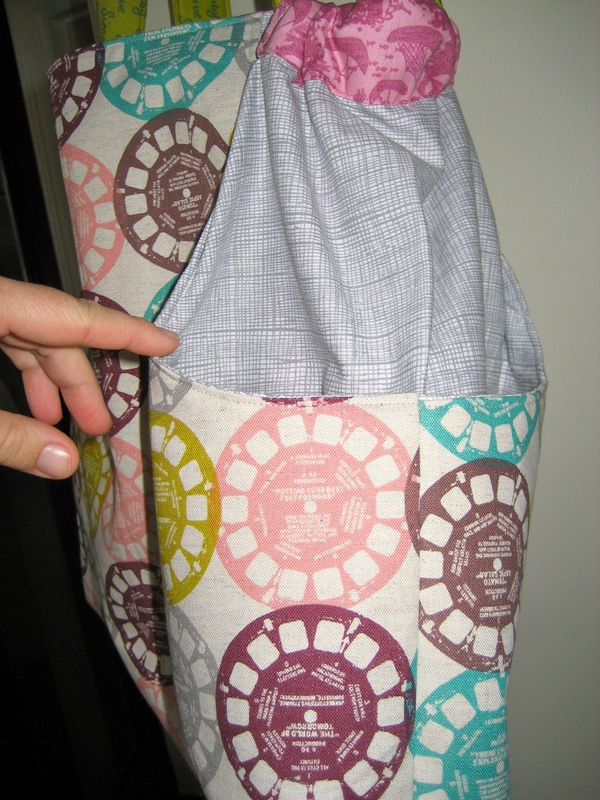 I just love these divided, large side pockets. Perfect for water bottles or anything else you need at the ready. The design is genius, with the bag folding down to create a casing for the straps. The only alteration I made was to use a lined pocket inside. I just cut 2 pocket pieces out, sewed them right sides together (with a small opening in one side), and turned it out. I top-stitched along the top and secured it to the bag lining by sewing the other three sides (simultaneously closing the opening for turning). Here are the specifics: I used fusible fleece instead of interfacing and I really like the outcome. For the front I used Melody Miller Viewmaster from Ruby Star Rising. The sides are in AH Heath in gray, lining is Venice by David Textiles and the straps are from Creative Thursday's Meet the Gang. That said, I think you will see it up in my etsy shop soon (upon return of husband and camera). The bag is much bigger than I realized, and I am a small purse girl. Although I am planning to use this pattern again. What a perfect gift - it really is a nice bag! Oh, and I knew I bought those half off gingermen at Trader Joe's last year (and I mean 2010, not 2011) for some reason. We just called it an "art project," even the kids decided everything was past the point of edible consumption. Oh, and one last bit. In the previous post I mentioned a quilt-along and class, which should fill my plate for winter sewing, but I'm having a hard time resisting this quilt-along! Might just have to do it on my own time! That is one of my favorite bag patterns. Yours is lovely! And I want to do the sparkle quilt along too! yes my mom made that bag for me - and she lined the inside with oilcloth. I looooove it. Yours turned out really cute! Nice job! Thanks for adding the comment about how the pocket functions. I want to make this bag and now know the adjust the design a bit to avoid that little problem. Thanks so much for sharing---I saw your post on the threading my way linky party. Love the bag! And so much fun to see how your boys are enjoying themselves! LOVE that bag!!! The fabrics are perfect together too!! !